Focus on the music you love with these noise cancelling headphones from Bose. Let's take a look at the Bose QuietComfort 25 Acoustic Noise Cancelling Headphones. With Bose noise-cancelling technology, sounds you don't want to hear are blocked out, so you can focus on the music you love. And the proprietary audio technologies of these headphones means they deliver full-range sound that's powerful and clear. From deep bass notes to soaring vocals, you're going to hear it all. They also have what's called unpowered audio, which means their performance is similar to Bose around-ear audio headphones when the battery dedicated to noise-cancelling runs out. And because they're made from lightweight materials and have an around-ear fit, they're so comfortable you can wear them all day long. 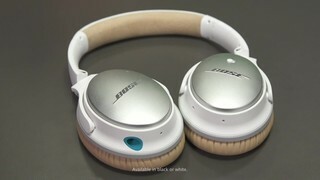 Stop by your local Best Buy for the latest from Bose, Bose QuietComfort 25 Noise Cancelling Headphones, or buy them right now on bestbuy.com.